The Mercedes Benz SLS AMG Coupe has arrived at Revol Carz Makeover for a dynamic transformation with the award-winning, ZeTough Ceramic Paint Protection Coating. The SLS’s massive elongated bonnet, a shoulder-line extending along the side wall, the broad powerful rear end and the athletic fastback design promise undiluted motoring enjoyment. The door handles pop out automatically when you unlock the gull-wing doors and retract when the car moves off. The new SLS AMG 4.0-litre twin-turbo V8 engine with dry sump lubrication and 7-speed sports AMG SPEEDSHIT DCT transmission delivers a stunning century sprint in just 3.7 seconds and can reach a top speed of 317 km/h. Contrary to mass production, every engine is built by hand in keeping with the “one man, one engine philosophy” – evidenced by the technician’s signature of the AMG engine badge. 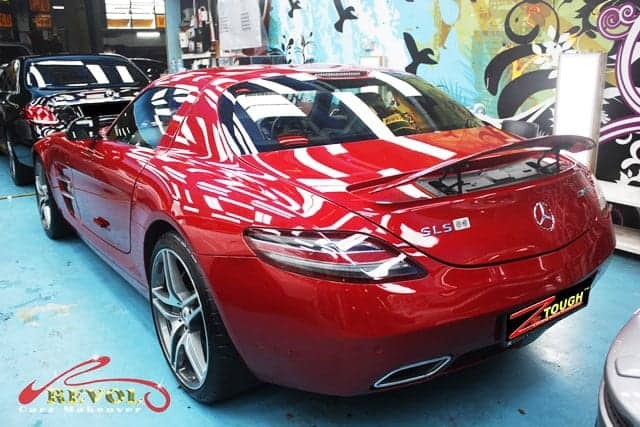 Come be amazed as we carry you away with our posting of following pictures showing the progressive transformation of the Mercedes SLS AMG Coupe to a gorgeous beyond-showroom lustre. There is nothing quite like the brilliantly smooth showroom shine of a car. ZeTough Ceramic Paint Protection Coating retains the shine longer. Under the elongated hood lies an awesome super-clean potent 4.0-litre twin turbo V8 new-generation engine – the spotlessly clean engine bay is pride and achievements of Revol’s dedicated detailers. Perfection in consistent detailing resulted in a super-clean cockpit. Every detail stands for the aesthetics of the Mercedes SLS AMG – pure sportiness and exclusive sensuousness. 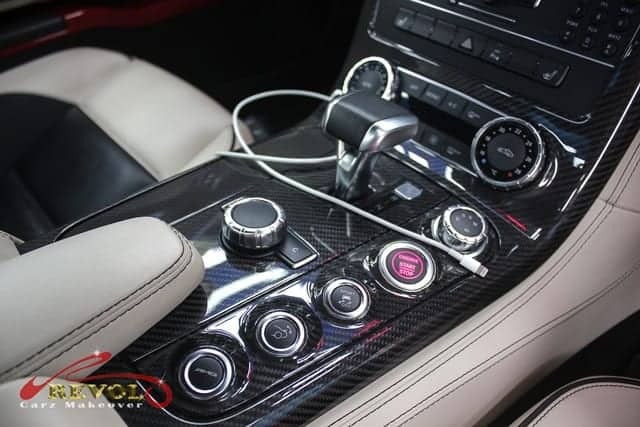 The dynamic AMG DRIVE UNIT with AMG DYNAMIC SELECT center console rises towards the instrument panel. See to believe the deep, lasting shine of the up-closed wing mirror. The rear spoiler extends at 112.65 km/h (70 mph) and retracts again at 80.47 km/h (50mph). A button in the centre console allows it to be deployed at slower speeds. The integrated exhaust pipes get cleaned and polished by hand. 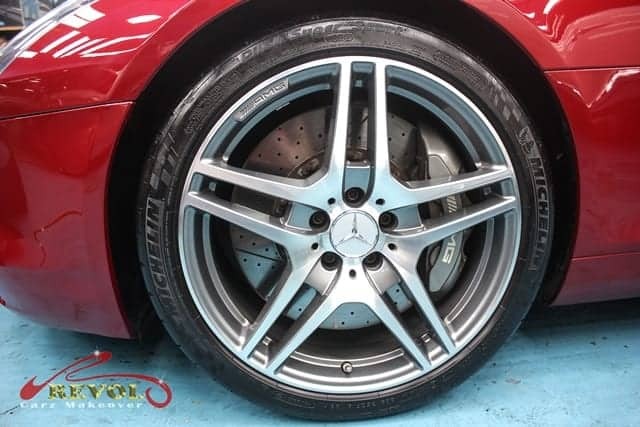 The seven-spoke alloys wheels were dismantled for cleaning and polishing for the grand showroom looks. 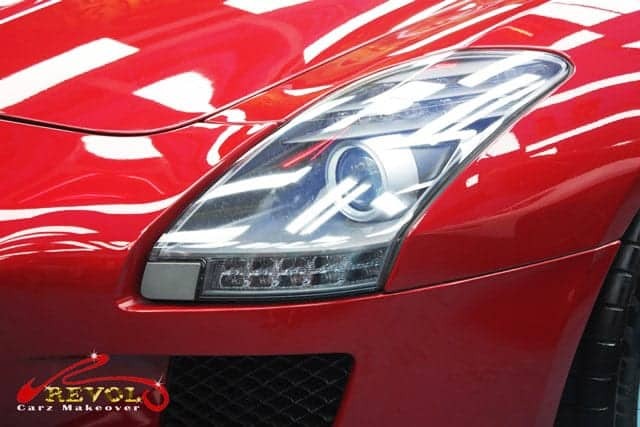 Nothing gives us more inspiration than giving every car-owner more reasons to smile with satisfaction and astonishment when they collect their cars after the extreme makeover. After Revol’s professional makeover, the Mercedes SLS AMG, indeed looked unrecognizably more brilliant than in a showroom condition. 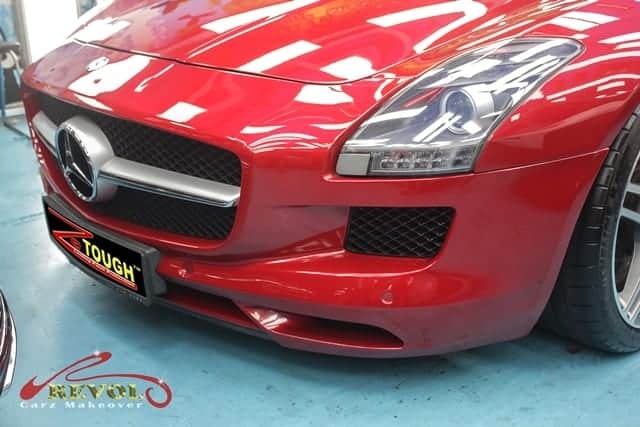 ZeTough’s incredibly long lasting protective luster promises to give the paintwork an extra long-term protection. 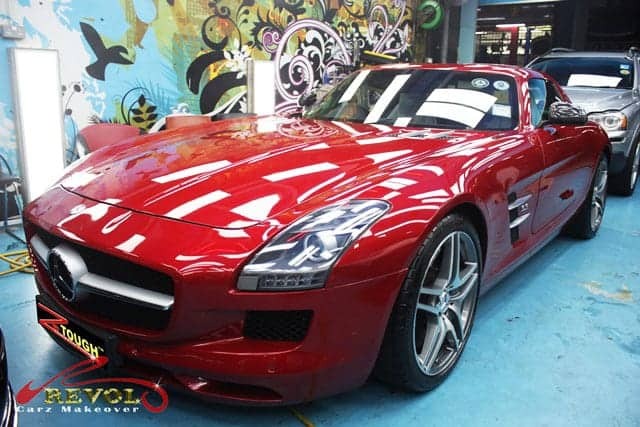 Fascinated by the SLS AMG’s makeover? Your car too can enjoy the reliable, long lasting surface protection. You can count on our proven, ZeTough Ceramic Paint Protection Coating. Yes, imagine what we can do for your car!